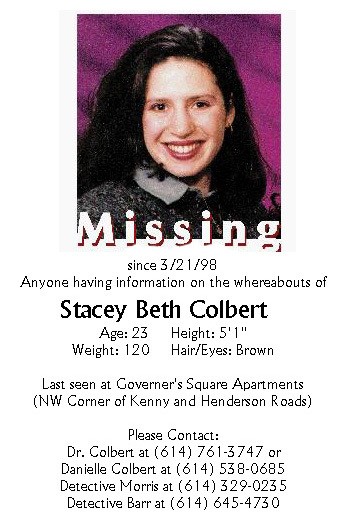 Stacey Colbert, age 23, a recent Ohio State graduate, disappeared from her Columbus, Ohio apartment on March 21, 1998. Stacey's family and friends have organized an extensive search effort and would like your help. Anyone with information about Stacey's disappearance should call Detectives Morris or Barr at the Columbus Police Department (phone numbers are provided below). If you can volunteer your time to help us find Stacey (post flyers, etc. ), please contact Danielle Colbert at 614-538-0685.
and my heart will go on and on"